Athletes are some of the most powerful individuals in the world today and their platform can be used to encourage, or discourage the people that watch them take the field or court. Oftentimes, all you ever see published is the negative story about an athlete, one who made a careless decision that ultimately costs them respect and the opportunity they were blessed to have. However, the best and most heart touching stories occur when the stands are empty and the cameras are turned off, which is what took place at Cliff Hagan Stadium earlier this summer. The thirteenth day of June will be a day that Riley Mahan will always remember; the day a childhood dream of playing professional baseball became a reality. The Miami Marlins selected the former Kentucky second baseman in the third round; however, the day that followed is the day that changed his life. Following the draft, Mahan began receiving countless texts, tweets, and messages, congratulating him on such a tremendous accomplishment he had worked so hard to achieve. One of those messages came from Shannon Russell; a fan that reached out to congratulate Mahan and included a simple request that he never thought would take place. Russell, who resides in Richmond, KY., is the founder and president of Lil’ Heart Sluggers, a non-profit foundation that offers support for families of children that will have heart surgeries. Shannon, and his wife Miranda, operate the foundation, which donates a baseball case, ink pad, mini Louisville Slugger bat, and a Lil’ Silver Slugger Award after a child undergoes heart surgery. The foundation recently picked up their 500th little slugger member and all are special to the Russell family. However, the Russell’s have a Lil’ Heart Slugger of their own, their son Jaxon, who was born with several heart defects. Jaxon has undergone two open-heart surgeries, the first when he was six days old, a second when he was four months old, and more are in the future. Prior to delivery, doctors had no idea that Jaxon had any complications or issues with his heart, but it only took a few hours for them to realize something was wrong. Just hours after he was born, Jaxon was fighting for his life and his parents were left waiting, hanging onto anything they could. Shannon and Miranda spent time in prayer, not knowing if their son would make it through the night. In the midst of the most frightening moment of their lives, the Russell’s found some hope in a baseball that Shannon had packed in Jaxon’s diaper bag. The ball had a reason for being there, as they planned to put Jaxon’s handprint on it, an idea they discovered on pinterest. Little did they know that idea would impact so many lives of families facing the same adversity they were facing. At that moment, the Russell’s stopped thinking about what could happen the next day and felt like they finally had a sense of peace with their son. Following two successful open-heart surgeries for Jaxon, the Russell family wanted to figure out a way to touch families facing similar situations. That is how the idea of Lil’ Heart Sluggers came to fruition. Lil’ Heart Sluggers is reaching families all over the United States and is now spreading to areas outside the country. 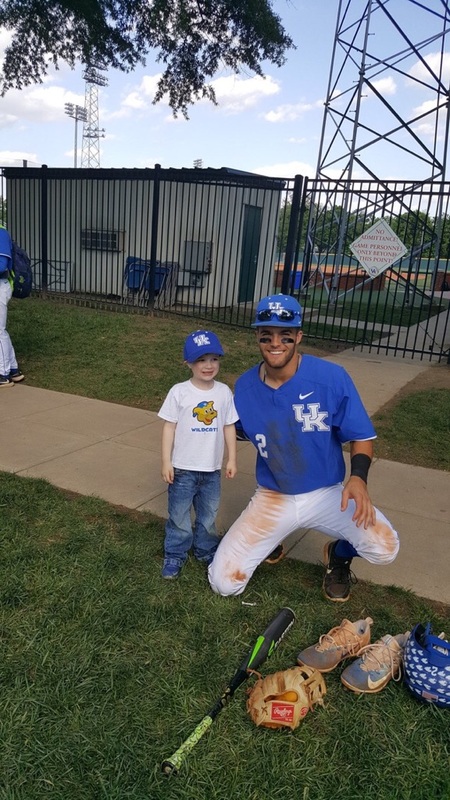 Through the foundation, Shannon and his family made a connection with the Kentucky Baseball team. UK Baseball has been a huge supporter of Lil’ Heart Sluggers, kindly donating baseballs for the foundation to send to new members. That connection led Shannon, a lifelong baseball fan, to purchase a season ticket to watch the Wildcats play. That is how the connection with Mahan was established, who quickly became Jaxon’s favorite player. Following draft day, Shannon took to Twitter, like so many others, to congratulate Mahan on an amazing accomplishment. The next day, the Russell’s made their way to Cliff Hagan Stadium, where they met up with Mahan, who had just been drafted 24 hours prior. What took place that day was a moment that both the Russell’s and Mahan will never forget, but it wasn’t the first time that Riley and Jaxon had met. Mahan recalls how full of energy Jaxon was and the laughter the two exchanged in that initial meeting. At that moment, Shannon explained a little about Jaxon’s life and the Lil’ Heart Sluggers foundation, which immediately impacted Mahan. During the meeting at the stadium, Jaxon got to play catch and even take some swings in the barn, the hitting facility located down the right field line at Cliff Hagan Stadium. Jaxon wasn’t the only one who enjoyed that day, as the Russell’s two daughters, Lacie and Abby, also had the chance to hang out with Mahan. That day in Lexington is something the Russell’s will never forget. Both the Russell’s and Mahan walked away impacted from a beautiful moment that took place in an empty ballpark. A day where no fans were in the stands, no one was on the field, and no press could interrupt or ask questions. Just a boy and his favorite baseball player playing catch on a field that developed Mahan into an MLB player. Mahan is not only a professional player, but he is also a professional person, one of the best you will ever meet. The Russell’s, like most that watch the smooth swinging lefty from Ohio, fell in love with Mahan and will remain fans for life. Likewise, the Russell’s also have a fan for life in Mahan. The Russell family is doing a great thing with Lil’ Heart Sluggers and any donations to the foundation are welcome and greatly appreciated. Through Go Big Blue Country and the help of former Wildcats, the plan is to raise money for the Lil’ Heart Sluggers, with all funds going straight to helping touch the lives of children and families who need it most. You can visit lilheartsluggers.org to learn more about a wonderful foundation.